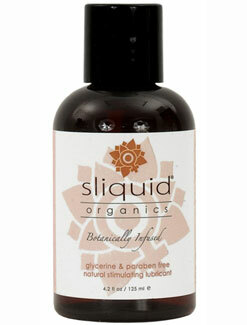 Sliquid Organics Sensation is a waterbased, stimulating personal lubricant botanical infused with natural ingredients, including food grade menthol. It is designed to heighten sensitivity and provide a light, pleasurable, tingling with a cooling sensation during use. Latex, rubber and plastic safe. Formulated and manufactured in USA. Purified water, Plant cellulose(from cotton), Aloe borbadenis, Natural tocopherole (Vitamin E), Cyamopsis, Extracts of Hibiscus, Flax, Green tea and Sunflower seed, Menthol, Citric Acid, Phenoxyethanol. - Certified organic. While this is not as stimulating as the Sliquid Stimulating O Gel, I did find the sensation pleasant, mild and not overwhelming. Here is what I really liked about it- it is nontoxic and hypoallergenic, it stays slick and has no smell or taste, it is clear and non staining and it does not get flaky. It was more mild than I thought it was going to be, but it is really nice to use along with my O Gel as the two compliment one another. Plus my husband does not like strong stimulating lubricants so this was a perfect blend for both of us.